Small businesses are the constant target of scam artists hoping to take advantage of understaffed and sometimes inexperienced office staffs. One of the more frequent scams is sending an official-looking document instructing the business to pay for and display state posters setting forth wage and hour rules, work safety regulations and so forth. In Washington State, the attorney general has sued California company Labor Standards Compliance Office (LSCO) and its principal, Fangliang Cui, for alleged violations of the Washington State Consumer Protection Act (CPA) after receiving 84 complaints from businesses about a misleading letter sent from LSCO. Business owners have been receiving an official-looking letter in the mail, implying the business must buy required workplace posters for $295, or face fines and audits. State and federal governments do require certain posters to be placed at job sites. While private vendors may sell the posters, the Washington State Department of Labor & Industries (L&I) and other government agencies provide the posters for free. The mass mailing has confused business owners who assume the letter is from L&I. In fact, the Department did not send the letters. The misleading letter looks like a bill addressed to individual businesses. 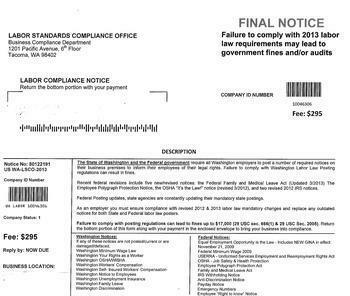 It uses alarming words like ‘FINAL NOTICE,’ and ‘DUE NOW,’ and includes a payment stub for $295. The attorney general's office has learned of a similar telemarketing scam. Labor Law Compliance Institute has been calling businesses, from 1.888.562.0999, trying to sell labor posters for $143 that are free of charge from L&I. They have an ‘F’ rating from the Better Business Bureau. “No matter how a labor poster solicitor tries to contact you, remember you don’t need to pay for posters that are free,” Ferguson said.